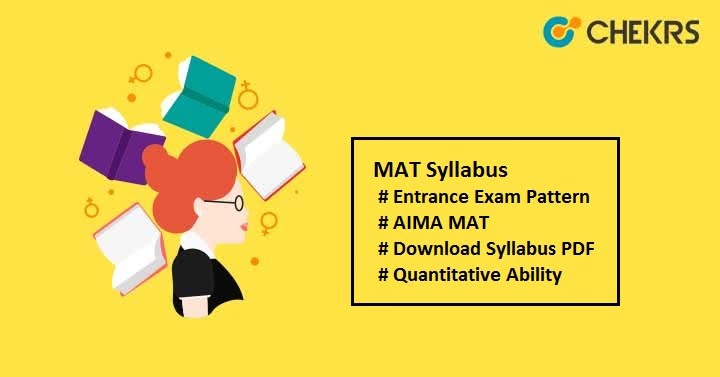 MAT Syllabus 2019: Candidates can apply for AIMA MAT 2019 in order to get admission in MBA or other management programs offered by various management institutes across India. MAT exam is easier than CAT exam. But still to qualify any exam, we should be well prepared. To crack the exam, right information about the Syllabus and MAT Entrance Exam Pattern is very important. Candidates should make a proper study plan in such a way so that they can cover the whole syllabus in the minimum time period use the remaining time for revision. The AIMA officials have not prescribed any syllabus so take a look at the important topics from which the questions have been asked and prepare yourselves accordingly. Candidates should be familiar with the MAT Exam Pattern before appearing for this exam. It will help you to know the necessary information such as mode of examination, medium of paper, time duration, marking scheme etc. 1 point will be given for right answer. ¼ will be reduced for each wrong answer. Candidates can also take help of MAT Previous Year Paper to get the rough idea of original question papers. You should practice previous year papers to strengthen your exam preparation and to analyze your weak & strong areas. You can solve Sample Papers also to learn time management skills. For further query you can ask in the below comment section. We will give relevant answer to you. Good Luck!! !